Jewellery Sets There are 34 products. 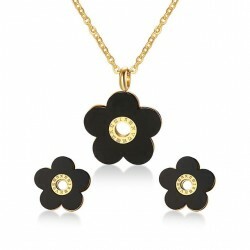 Women's earrings & necklace jewellery set. Material: alloy, metal, rose gold plating. Stone: cubic zircon & austrian crystal. Earrings & pendant size: 18 * 12mm. 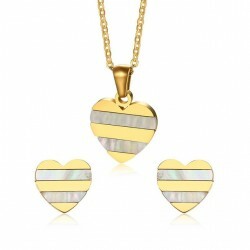 Gold & pearl heart, women's jewelry set. Material: stainless steel, pearl. Pendant size: 17 * 15mm. Earrings size: 10 * 11mm. Chain length: 45cm. Necklace & earrings, women's jewellery set. Material: stainless steel, shell, zircons. Earrings diameter: 16mm. Pendant size: 30 * 39.5mm. Chain length: 50cm. Weight: 13g. 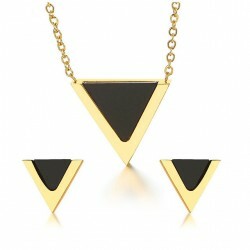 Love & triangle, women's jewelry set. Material: stainless steel, pearl Pendant size: 39 * 31mm. Earrings size: 17 * 14mm. Chain length: 44.5cm. Weight: 11g. Heart design women's jewelry set. Material: stainless steel, pearl. Pendant size: 20 * 16mm. Earrings size: 14 * 11mm. Chain length: 45cm. 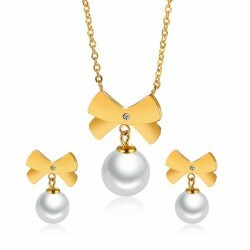 Bowknot & pearl, women's jewellery set. Material: stainless steel, pearl, zircon. Pendant size: 19 * 10mm. Earrings size: 6 * 13mm. Chain length: 45.5cm. Necklace & earrings, women's jewellery set. Material: stainless steel, turquoise, zircon. Pendant size: 33 * 84mm. Earrings size: 55 * 16mm. Chain length: 45.5cm. Necklace & earrings, women's jewellery set. Material: stainless steel. Chain diameter: 14.6cm. Size: 29 * 23.5mm. Weight: 24.3g. Necklace & earrings, women's jewellery set. Material: stainless steel, rhinestone. Earrings size: 58 * 8mm. Pendant size: 41 * 8mm. Chain length: 45cm. Please select a color. Earrings & necklace, women's jewellery set. Material: stainless steel, shell, rhinestones. Earrings diameter: 17.7mm. Pendant size: 30 * 34mm. Chain length: 45.5cm. Weight: 23.5g. Earrings & necklace, retro women's jewellery set. Material: stainless steel, enamel. Earrings size: 13 * 13mm. Pendant size: 24 * 19mm. Chain length: 45cm. 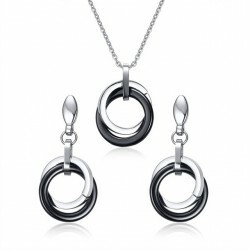 Earrings & necklace, round women's jewellery set. Material: stainless steel, cubic zirconia. Earrings size: 18 * 18mm. Pendant size: 40 * 47mm. Necklace length: 46.5cm. Weight: 26g. Earrings & necklace, women's jewellery set. Material: brass, cubic zirconia, white gold plating. Earrings diameter: 13mm. Pendant size: 16.5 * 14mm. Chain length: 41.5cm. Weight: 7.5g. Triangle earrings & necklace, women's jewelry set. Material: stainless steel. Earrings size: 10 * 9mm. Pendant size: 15 * 13mm. Chain length: 46cm. 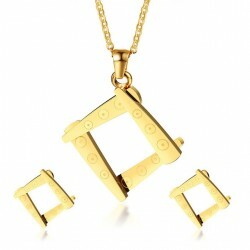 Square necklace & earrings, women's jewellery set. Material: stainless steel, IP gold plating. Earrings size: 15 * 16mm. Pendant size: 32 * 29mm. Chain length: 45cm. Necklace & earrings, women's jewellery set. Material: stainless steel, IP gold plating. Square diameter: 5mm. Ball diameter: 4mm. Chain length: 45cm. Women's earrings & necklace set. Material: stainless steel, pearl. Earrings diameter: 18mm. Pendant size: 30 * 24mm. Chain diameter: 2mm. Chain length: 50cm. Weight: 27.6g. Women's earrings & necklace, set. Material: stainless steel, shell, zirconia. Earrings size: 17.6 * 20.5mm. Pendant size: 35.3 * 41mm. Chain length: 45.5cm. Chain diameter: 2mm. Weight: 16.8g. 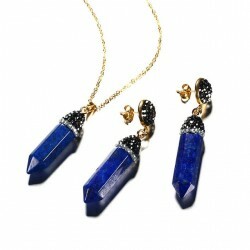 Women's earrings & necklace set. Material: stainless steel, gold plating, zirconia. Earrings size: 12 * 11.3mm. Pendant size: 13.6 * 22mm. Chain length: 50cm. Chain diameter: 2mm. Weight: 1.4g. Women's earrings & necklace, set. 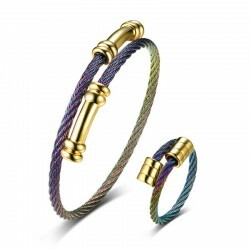 Material: stainless steel, gold plating, enamel. Earrings size: 16 * 11.5mm. Pendant size: 42 * 31mm. Chain length: 50cm. Weight: 11.8g. Please select a color. Women's earrings & necklace set. 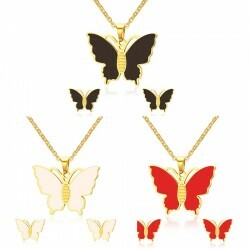 Material: stainless steel, gold plating, enamel. Earrings diameter: 15mm. Pendant diameter: 30 * 35mm. Chain length: 47.5cm. Weight: 20.6g. Women's earrings & necklace, set. Material: stainless steel, zirconia. Earrings size: 20 * 36mm. Pendant size: 20 * 30.7mm. Chain length: 50cm. Chain diameter: 2mm. Weight: 9g. Women's earrings & necklace, set. Material: brass, white gold plating. Stone: blue crystal, zirconia. Earrings diameter: 12mm. Pendant size: 13 * 15.5mm. Chain length: 48cm. Weight: 8.4g. Women's earrings & necklace, set. Material: stainless steel, cubic zirconia. Earrings size: 11mm. Pendant size: 17.5mm. Chain length: 50cm. Weight: ~ 3.2g. Women's earrings & necklace, set. Material: stainless steel, turquoise. Earrings size: 54 * 15mm. Pendant size: 28 * 88mm. Chain length: 45.5cm. Weight: 26g. Women's earrings & necklace, set. Material: stainless steel, rhinestones, gold plating. Please select a type. Women's earrings & necklace, set. Material: stainless steel. Necklace layers size: 3 / 4 / 6cm. Earrings diameter: 25 * 2mm. Chain length: 48.5cm. Weight: 9.4g. Please select a color. Women's earrings & necklace, set. Material: stainless steel, rhinestones, turquoise. Earrings size: 54 * 16mm. Pendant size: 33 * 86mm. Chain length: ~ 47.5cm. Weight: 39g. Women's earrings & necklace, set. Material: stainless steel, ceramic. Earrings size: 38mm. Pendant size: 23mm. Chain length: 50cm. Weight: 13.7g. Owl earrings & necklace women's jewellery set. Material: stainless steel, crystals. Earrings size: 14 * 13mm. Pendant size: 45 * 34mm. Chain length: ~ 45cm. 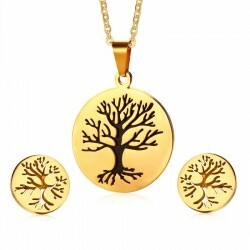 Earrings & necklace women's jewellery set. Material: stainless steel, gold plating, rhinestones. Earrings size: 3 * 24.3mm. Chain length: ~ 69cm. Weight: 14.9g. Choker & earrings women's jewellery set. Material: stainless steel, pearl, gold plating. Earrings diameter: 12mm. Total length: 45.5cm. Weight: 25g. Crystal & gold, women's jewellery set. Material: zirconia, pearl, stainless steel. Earrings diameter: 7 * 13.5mm. Pendant size: 35.3 * 41mm. Chain length: 45cm. Set weight: 19g.